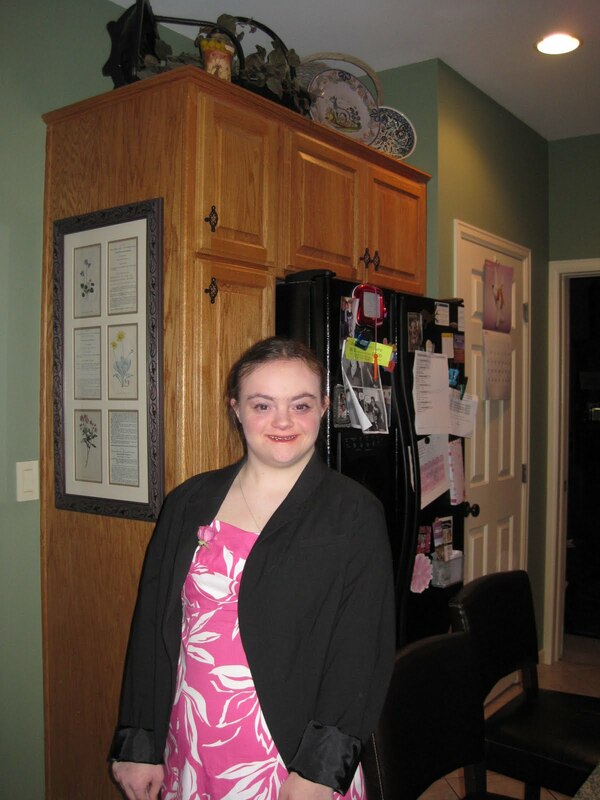 The Ordinary Life of an Extraordinary Girl: A prom like no other! A prom like no other! Every high school junior wants to go to the prom, and Alex is no exception. Alex knows a lot about proms from the Disney Channel, the girls all get dressed up, the boys ask the girls to dance, and everyone ends up kissing. This was the prom Alex expected. It was not the prom she had, just like many a prom girl she was disappointed. Many a high school girl comes home from their prom in tears. I have heard stories of boyfriend stealing, ugly dresses and exclusion. I know this is part of the high school ritual and part of me accepts that, but another part of me wants Alex’s life to be the best it can be. Her dreams and hopes deserve to be honored, just like everyone else’s, and her IEP is the tool we have to ensure this. I asked Alex to work with her teacher on the prom, specifically appropriate attire and behavior. She and Ms C did this and I even received a couple of e-mails of dresses Alex would like to wear. I then followed up with the counselor to see how peer group was working and asked if she could help Alex talk with the “regular ed” girls in the group about dancing and hanging out. Once again, promises made and not kept. The peer group I had been reassured was going on was a peer group of Alex and her resource room classmate. When I asked about the other girls, I was told there weren’t any…despite assurances to the contrary. I then asked if Alex has worked on asking girls to hang out with her at the prom, once again “no”. The suggestion came back that she ask her teammates from the Special Olympics to attend with her. To say I was shocked is an understatement. Alex’s IEP goals clearly state the promotion of inclusive events and provides goals and tactics to help Alex learn to interact with peers. As we got closer and closer to the date I became more and more infuriated with the complete lack of respect for Alex and her ability to succeed at the Prom. I recognized I was going to have to call in troops for Alex and pay $90 as there were not High School students willing to go with Alex. We also asked T, Alex’s “boyfriend” from another local high school, but the proms were on the same night. I was so angry about this entire incident that I asked Alex’s teacher to waive the $90 I had to pay to import friends for Alex. This led to a conference call with the Principal, Alex’s teacher and the Counselor, who admitted she had not been able to get girls to attend peer meetings. When I probed, the Principal told me he could not make anyone do anything they did not want to and he did not facilitate interactions for regular Ed kids, why should he make an exception. The great communication with Alex’s school continued last week with the announcement that the Prom was going to be held last Saturday night. Gary contacted the school to see how Alex was going to be supported in attending this school sanctioned event. True to form, we were told that the school was to be of no assistance. It continually disappoints me that Alex’s school fails to help her learn lessons in social behavior which is a part of her IEP. The school principal has gone from pretending to help to lip service to being downright obstinate in his refusal to assist our daughter. Gary came up with a brilliant idea for Alex’s benefit. At our son Tom’s school, helping others in the community is a main tenet in the success of each student. During past vacations, when boarding students were not able to travel to their homes, we have hosted several of these kids in our home. One girl in particular has bonded with Alex and Gary asked her if she would like to attend the Prom with Alex. C brought another student, V with her to our home where the girls went through the requisite preparatory rituals, fixing hair, make-up and generally getting all excited for the night to come. I dropped off the girls at the dance and was hoping that this would be the first time that Alex would make it all the way to the end of a school party. She got closer than ever, as with an hour or so left I got the call to come pick them up. Alex was using the excuse that her foot was sore, which it probably was, as she has been out of her cast for only a week or so, but the underlying issue was the fact that there were many couples and boys were not asking her to dance. Alex is now aware that she does not have the social life of her peers, and especially the social life of the Disney Channel high school kids. It bothers me some that our daughter has had her mind shaped so much by television, although I am also comforted by the fact that she can comfortably spend a lot of time alone, and at least the overriding themes of these shows is positive. Certainly being a middle child who also has Down Syndrome has not helped in these social situations. Alex’s two escorts were fantastic with her though, and on balance the Prom experience was a mild success, especially if you include the opportunity C and V had to go to a high school dance where they otherwise wouldn’t have had the opportunity, and the opportunity to share some of their personal stories and lives with Alex. The Prom was an opportunity for Gary and me to unite in our resentment toward the school administration, recall our own unsatisfying Prom experience and get to a creative solution on the fly. Hopefully, it did some people some good, as even if the regular crowd didn’t include Alex in their experience, they had to at least notice she was there with a couple of cute, mysterious girls. Alex did win one of the raffle prizes, which got her some positive recognition. I wonder if L, the controversial basketball coach, who was the raffle selector, rigged the game a bit to assuage her guilt from how Alex was treated during the b-ball season… Hmmm, although anything that puts a smile on Alex’s face is fine with me. In the end, Alex had fun. She and I had a girl’s night out and got a prom dress and new shoes, just like all prom girls. She and her girl friends spent hours on their hair and make-up, just like all prom girls. Alex danced with the girls, won a prize, and got acknowledged for her prize. However, C texted about two hours into the event and said Alex wanted to come home because she was tired of dancing with girls and wanted boys to dance with her, just like all prom girls. The fights, the money, the importing of friends, it was all worth it. My sweet and special daughter had a prom just like all teenage girls. What else could a Mom ask for? While I think that the mysterious girls C and V really had a great time with their mate Alex (and it's great to have a service school in the background), I still think Special Olympian teammates would have had a great time too if they came. It is still okay to have disabled people to an event if they are less than 10% and do not make a congregate (and are not seen as gatecrashes). See "Test Questions" on CLIMB EVERY MOUNTAIN and give to Alex's teachers and friends. Especially the bit about the Pennsylvanian prom. Mme Ulrich is the person who I got the 10% from: it would be closer to 20% in Oz if the "natural proportion" was followed. They would also be part of her natural peer group, as they are the people she spends months of the year at a time. Having a celebratory event when they blend in would be great. Glad Alex's school is not too strict about other schools/groups coming along. Sometimes the prom-equivalents are for that school only. And I'm also really glad they didn't think of doing the Constance thing (many people are excluded for many reasons and non-reasons. Doesn't make it right!). It's a lesson for us content creators to think big! For instance, an author could have someone with a disability on the prom committee/self-advocate in her next book. And I would say "Good on you for making good your own unpleasant prom experiences". Ashwood School had a wonderful documentary about their ball to see what is possible. It was made in November last year . The teenage girl in there - Natasha - could probably share a lot of things. There are also lots of girls on the dance floor. 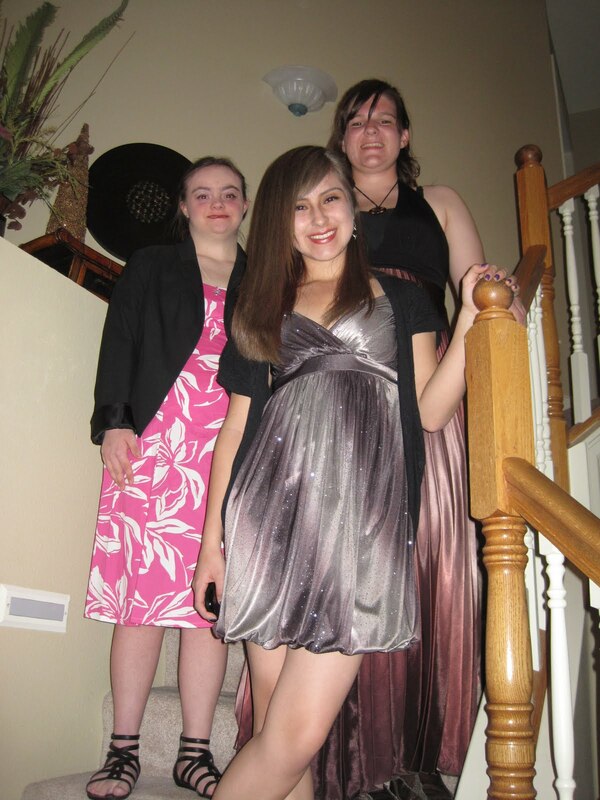 It is certainly infuriating that Alex's school disregards her educational goals, as set in the IEP, but I'm not sure why you feel this way: "HOW COULD ANYONE THINK A GROUP OF GIRLS WITH DISABILITES TOGETHER AT A PROM was a good idea"? Is it because they might get teased? Simply because it ignores her social goals? You often talk about Alex shines with her peers--wouldn't inviting her peers to her dance be a chance for her to shine? I'm genuinely curious, because, of course, you actually know the folks involved! Thanks for the comments - and to Z - I tried to e-mail you with a response to your question - but the e-mail link did not work. I will attempt to answer you question with my entry this weekend folloiwng the special olympics regional swim meet.